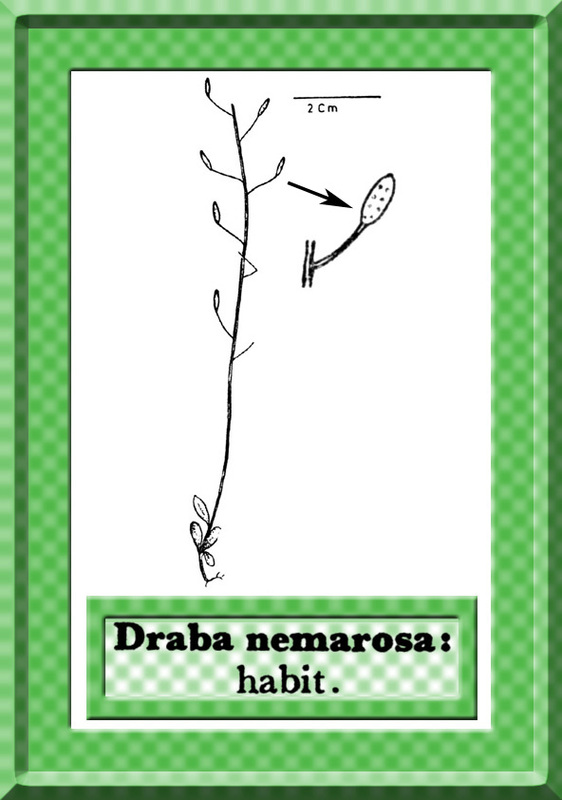 Draba nemorosa Linn., Sp. Pl. 643. 1753. Schulz in Engler, l.c. 309; Tolm. in Kom., l.c. 451; Coode & Cullen in Davis, l.c. 420; Hedge in Rech. f., l.c. 183. Draba muralis auct., non Linn. Annual, 5-25 (-40) cm tall, erect, simple or branched mostly from the base, leafy. Basal leaves rosulate, oblong-obovate, 8-35 mm long, 3-15 mm broad, obtuse, remotely dentate to subentire, sessile; cauline leaves 0-few, distant, oblong-ovate, 5-25 mm long, 2.5-12 mm broad, sessile, acute, 3-6-dentate; all leaves ± hirsute with simple and branched hairs. Racemes many flowered, ebracteate, up to 25 cm long in fruit. Flowers c. 2 mm across, pale yellow; pedicels 5-10 mm long, increasing up to 25 mm in fruit, filiform, spreading. Sepals c. 1.5 mm long. Petals c. 2 mm long, apex sub-emarginate. Stamens c. 1.5: 1.7 mm long. Siliculae oblong-elliptic, 5-8 mm long, 2-2.5 mm broad, ± hairy with short, simple and branched hairs; stigma minute, almost sessile; septum not veined; seeds 10-18 in each locule, c. 0.7 mm long, ovoid, brown. Type: Described from Europe, Switzerland, Herb. Linn. no. 823/11 (LINN). Distribution: Widespread in most of the Arctic and Temperate Europe and Asia. A variable species; differs from Draba muralis L. by its long pedicels, subdentate leaves and fruits with many, very small seeds.